Staatsmann (1874–1965). Nice signed Life Magazin cover O. O. 315:265 mm. Randmängel. Staatsmann (1874-1965). Typed letter signed. Whitehall. 1½ SS. auf Doppelblatt. 4to. 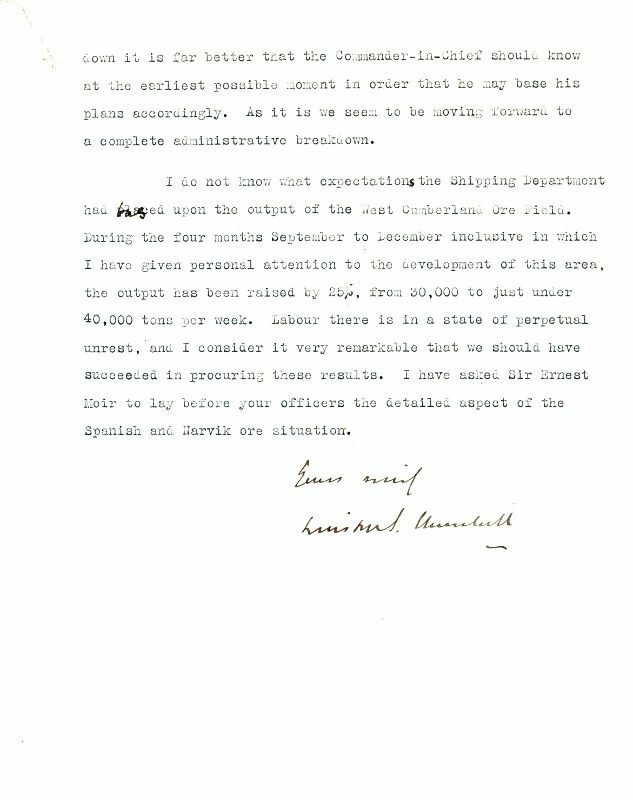 As Minister of Munitions, a stern wartime letter to his recalcitrant colleague Joseph Paton Maclay, 1st Baron Maclay (1857-1951), on gaining essential military raw material from Spain and Narvik (Norway): "Your letter of the 22nd inst. does nothing to relieve my anxiety. Whether importations of Ore from Northern Spain or from Narvick are considered, it is perfectly clear that shipments are now proceeding at a rate which must lead to a complete breakdown in the Iron and Steel production and so affect every industry concerned in the prosecution of the war. The Nitrate position is even more serious than the iron and steel, because in this case the whole supply is seaborne, and the entire process of ammunition filling will come to an abrupt arrest. It is, further, very difficult for me to proceed without any idea of what the future has in store. I failed entirely to obtain any answer on this point from your Department. I have to make an enormous series of arrangements for the supply of the Army which depend absolutely upon Raw Material, and we cannot be told even generally within what limits we may expect to be supplied. I have been pressing for information on this vital point for more than three months without receiving anything in return except your invariable courtesy. I really do not know what to do [...] As it is we weem to be moving forward to a complete administrative breakdown [...]". - On stationery with printed letterhead of the Ministry of Munitions; punched holes at top left corner..
Staatsmann (1874-1965). Document signed. O. O. 2 SS. auf 2 Bll. Folio. 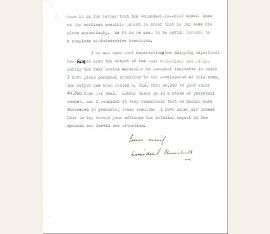 Memorandum of agreement between Churchill and his publisher for the rights to publish Churchill's "Europe Since the Russian Revolution". 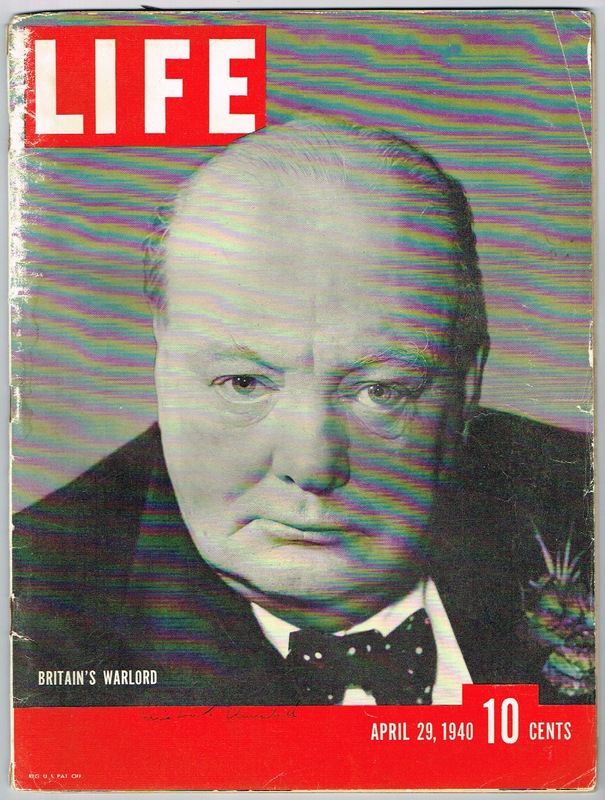 One of the few literary projects that Churchill ever abandoned, his projected work on Europe since the Russian Revolution would surely have been a fascinating addition to the Churchillian canon. This contract with Harrap called for the author to receive the generous amount of £13,500, payable in installments: £1,500 up front; £2,000 on the delivery of the first part of the manuscript; £3,000 on the delivery of the second; and £7,000 on delivery of the third. These payments would be in lieu of any royalties. 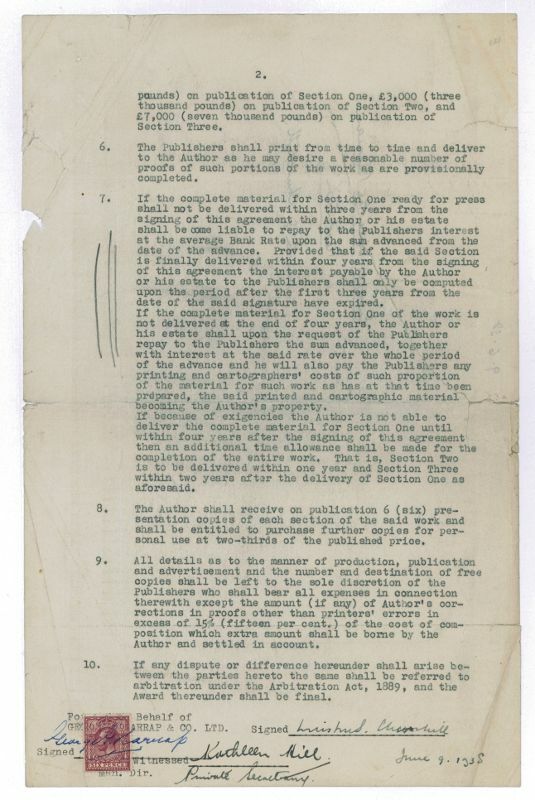 The contract calls for the first portion of the manuscript to be delivered by no later than June 1941, with Churchill obligated to return his advance with interest for failure to do so. Since this is precisely what happened, this paragraph is boldly marked thrice in pencil in the margin. - Churchill's demanding obligations as member of the War Cabinet and then as Prime Minister and saviour of Britain in 1940 did not leave Harrap in a forbearing or forgiving mood when Churchill tried to get out of this contract. Indeed, his growing stature made him all the more valuable as a literary commodity. 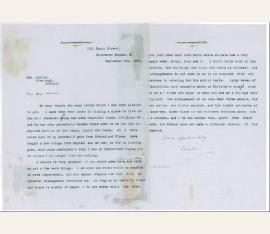 As called for in paragraph 10 of this document, the matter went to arbitration, with Churchill arguing that he had completely lost interest in the subject of Europe since the Russian Revolution. In any case, he was in no position to do anything about it: "I suppose I have not read a dozen books in the last five years." Besides, he added, writing about Russian relations might injure the delicate wartime alliance with Stalin. More than anything else, however, Harrap's hardball tactics annoyed him. When the publisher offered new contracts with much more generous terms, Churchill curtly refused, saying "I do not want to have any further dealings of any kind with them." Realizing he was beat, Harrap unconditionally surrendered on 7 September 1944, saying "it is distasteful to us, whether we are right or not, to litigate this matter with a man to whom every one of us is so much indebted" (cf. Reynolds, In Command of History, pp. 19-20). 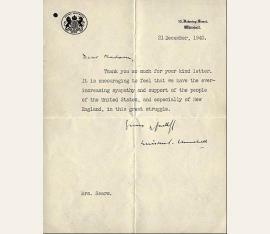 Churchill gave back the £1,500 advance with interest and went on to publish his war memoirs with Macmillan and Cassell's. - Somewhat dusty and frayed..
British statesman (1874-1965). Typed letter signed. 10 Downing Street. 4to. 1½ pp. on 2 ff. 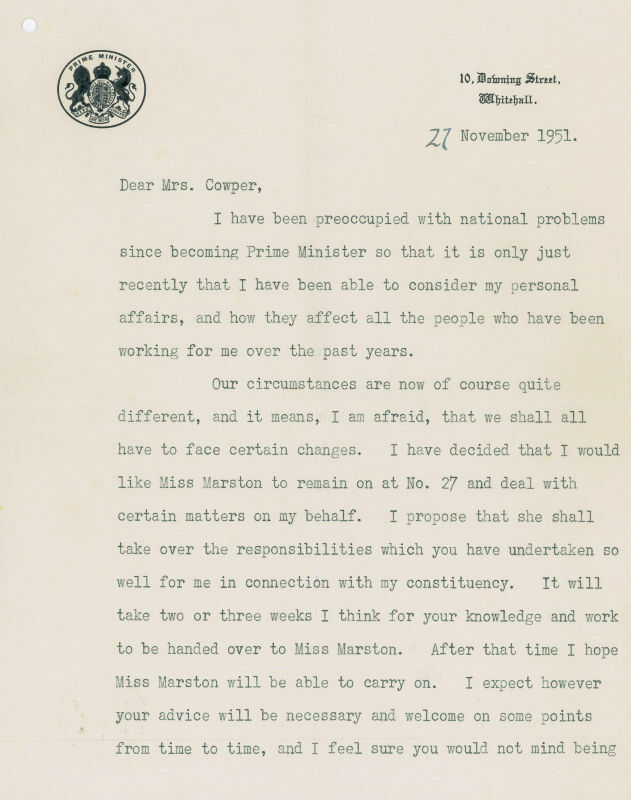 To Mrs Cowper, written on his re-accession to power in 1951: "I have been preoccupied with national problems since becoming Prime Minister so that it is only just recently that I have been able to consider my personal affairs, and how they affect all the people who have been working for me over the past years [...] I know how efficiently and happily you have looked after my affairs and interests in my constituency over the past years, and I wish you to know how much Mrs Churchill and I have valued your services and your loyalty [...]. - On engraved headed paper bearing the seal of the Prime Minister and blind-stamp of George VI, filing-hole at head. Winston Churchill (1874–1965). 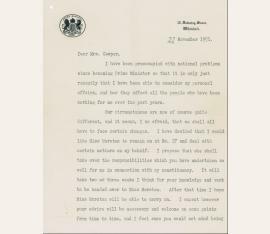 Typed Letter Signed on 10 Downing Street letterhead, underground war rooms in London, December 21, 1940 (the very day German bombers left Victoria Station in flames), to an American named Mrs. Sears. “Thank you very much for your kind letter. It is encouraging to feel that we have the ever-increasing sympathy and support of the people of the United States, and especially of New England, in this great struggle.” – This letter is historically important for two reasons. One lies in the knowledge that Churchill felt that Britain’s support in the U.S. was increasing, a prime goal of his and something crucial to Britain’s survival. Time would bear out the accuracy of this conclusion. The second lies in the view it provides into Churchill’s soul at this key moment in world history (and the high-water mark of the leadership which won him everlasting renown), evidenced by his classification of the war against Hitler, even at that early date, as “this great struggle.” Although Churchill left a voluminous correspondence, letters written during the Blitz in 1940 are so uncommon that a search of auction records discloses just one other comparable one having been offered over the last 30 years. 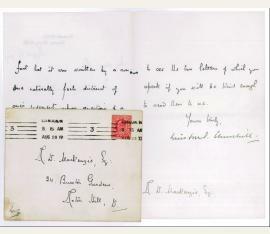 To A. W. MacKenzie, acknowledging a letter which evidently faulted him for neglecting the private side of Lord Randolph Churchill in the masterful political biography he had published the previous year; Churchill accepts that the work was "somewhat too severely circumscribed in its social and private side from the fact that it was written by a son", citing a natural hesitancy in treating private matters which are of course of considerable interest to the family but which "may appear trivial to the general public". - Fol. 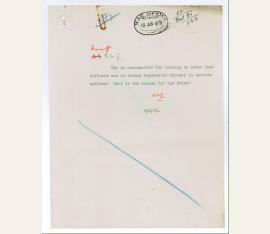 1 recto marked by Churchill as "private"; on stationery with embossed letterhead "Colonial Office, Downing Street, S. W.". 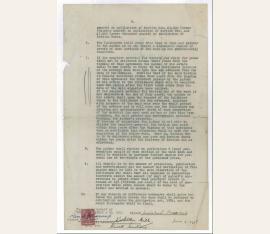 Autograph memorandum and typed memorandum, both signed with initials. The first asking who is responsible for an order that officers are to attend regimental dinners in service uniform, the second pointing out that the order is not always being obeyed, noting that as a regimental dinner is a "private affair", it was "undesirable to make the change to uniform", but that if it was to be done, "there ought to be compliance". - Punch holes, minor soiling, edges slightly frayed; slight ruststains from old paper clip. 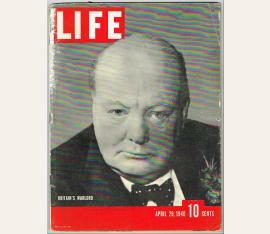 Brief m. e. Anrede u. U.
Winston Churchill (1874–1965), Staatsmann. Ms. Brief mit e. Anrede, Grußzeile und U., Chartwell (Kent), 28. Februar 1939, 1 Seite 8°. 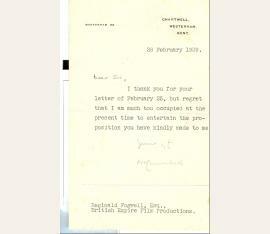 – An den britischen Filmproduzenten Reginald Fogwell von der British Empire Film Productions: „I thank you for your letter of February 25, but regret that I am much too occupied at the present time to entertain the proposition you have kindly made to me [...]“. – Auf Briefpapier mit gepr. Briefkopf.